100% Pure offers free 180ml Body Scrub with any $60 purchase. No code needed. While supplies last. AskDerm offers free Chi Ionic Low EMF Professional Hair Dryer ($260 value) when you spend a total of $600 during August. No code needed. Valid thru Aug 31. Bath and Body Works offers 20% off any purchase. Enter code LOVE20 at checkout. Valid thru Aug 5. Base Formula offers 20% off on their Aloe Vera & Seaweed Gel and Hydrolate Combo. No code needed. Enter thru link. While supplies last. Beauty.com offers a free deluxe sample of Perricone MD Vitamin C Ester 15 (a $15 value) with any $10 purchase. No code needed. Must enter thru link. While supplies last. Beauty Encounter offers 20% off skincare products. Enter code SKN342 at checkout. Valid thru Aug 31. Beauty Habit offers a free 10pc Deluxe Sampler and free shipping with any $125 purchase. Enter code SUMMERPOP at checkout. Valid thru Aug 10. Boscia offers free mystery gift (a $150 value) with any $40 purchase. Gift may include Cleanser, Tonic, Treatment, Moisturizer, Blotting Linens and more. Enter code Silver12 at checkout. Valid thru Aug 9. Carol's Daughter offers free shipping with any $25 purchase. No code needed. Valid thru Aug 5. Caswell Massey offers free Classic Men's Talc (a $16 value) with purchase of 2 boxes of Sandalwood, Newport, Jockey Club or Number Six 3 cake soaps. No code needed. Enter thru link. Valid thru Aug 5. Clinique offers free shipping with any purchase. Valid for Aug 4 only. Crabtree and Evelyn offers Pomegranante and Citron Gel/Lotion Sampler for $7.95 (regular retail price $18). While supplies last. Limit 1 per customer. Elizabeth Arden offers a new Purchase with Purchase. 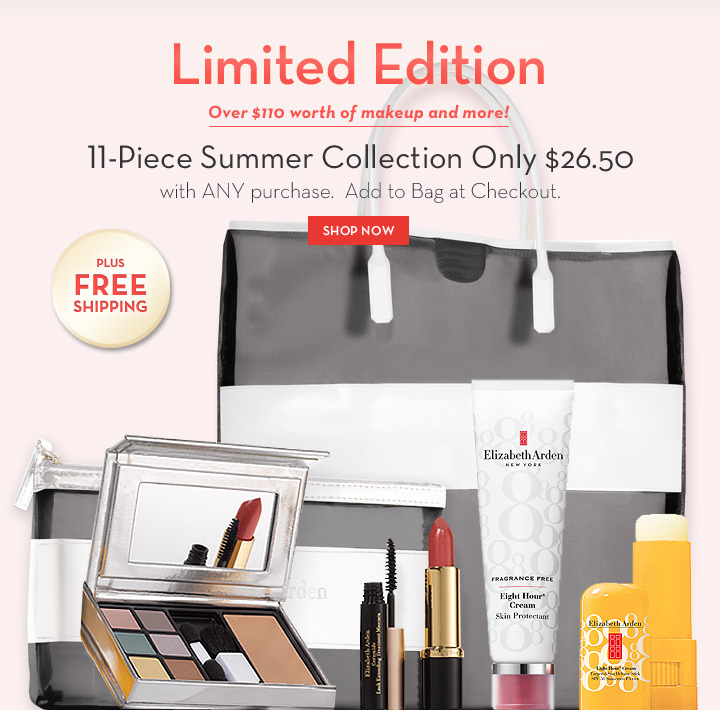 Get the limited edition (a $110 value) 11-pc Summer Collection for only $26.50 with any purchase. Add the PWP to your bag at checkout and get free shipping. Valid thru Aug 31. FragranceNet.com offers $10 off any $50 purchase. Enter code BEAUTYGAMES at checkout. Valid thru Aug 11. Juice Beauty offers free shipping with any $40 purchase. Enter code 40FS at checkout. Valid for Aug 4 only. Nordstrom offers Buy 2 Get 1 Free for nail polishes from Deborah Lippmann or Butter London. Enter code BUYANDSAVE at checkout. Valid thru Aug 5. Ole henriksen offers free 7ml Truth Serum with any $50 purchase. Enter code BRIGHTEN at checkout. while supplies last. Pangea Organics offers a free 30ml Facial Cream (a $16 value) with any purchase of Facial Toner (a 62% savings). No code needed. Valid thru Aug 31. Peter Thomas Roth offers new Laser-Free Resurfacing Kit for only $75 (a 142 value, 53% saving). No code needed. While supplies last. Sally Beauty offers 15% off on any $30 purchase. Enter code 555333 at checkout. Valid thru Aug 5. Sephora offers free mini Philosophy Full of Promise Dull Action Restoring Cream with any $25 purchase. Enter code PROMISE at checkout. Valid while supplies last. SkincareRx offers Beauty Vault sale again for up to 50% off on select beauty product. No code needed. Enter thru link. Valid thru Aug 5. Spalook offers 20% off storewide. Enter code FAVES20 at checkout. Valid thru Aug 13. Wei East offers free shipping with any $30 purchase. Enter code Facebook at checkout. Valid thru Aug 6. Yves Rocher offers free gift of your choice with any purchase. Choose at checkout from Floral Vantiy Case, Liquid Hand Soap Duo, Tropical Treasure Jewelry Set or Plant 3 trees for our planet. Top up your purchase to $45 and receive additional Classical Feminine Sunglasses. Valid thru Aug 26.